It’s a good thing technology is constantly evolving to solve problems like this. Here’s a roundup of some innovative technologies developed to help keep us toasty during this polar vortex. Depending on where you’re located in the United States, owning a winter jacket is not only a no brainer, it’s a must. According to Statista, in 2016 the retail sales of winter jackets market worldwide was $80.9 billion. This number is predicted to jump to $94.5 billion by 2021. However, some companies like Oros and Adiff are taking the classic winter parka to the next level. Oros, a company working to push your outdoor comfort zone boundaries, has done so by incorporating space-age technology into winter outerwear. The company uses aerogel, a material that has been put to the test by NASA, to insulate their jackets, gloves, beanies, and pants. The material has extremely low thermal conductivity due to its porous structure and is super lightweight because aerogel is more than 99% air. One of our very own ktMINE technologists has invested in one of these coats and can vouch for the Oros technology. Source: ktMINE, NASA patent for nanoencapsulated aerogel material. Heated Seats, Heated Blankets…Heated Concrete? For these below zero days where you want to hunker down inside, having self-heating concrete may be something you never knew you always wanted. This electric, self-heating concrete system uses embedded carbon macrofiber or nanofibers paper as an electric resistance heating element. The innovative system allows concrete roadways and sidewalks to be heated to above freezing temperatures in a well below freezing environment. So while the snow is falling outside, you can stay inside guilt-free, knowing those braving the elements can safely get to their destination. Being outside in Chicago on Wednesday and Thursday was not only unenjoyable but dangerous. The National Weather Service released a statement that Chicagoans were susceptible to frostbite in as little as five minutes. However, many businesses, specifically within the tourism industry, kept their doors open. 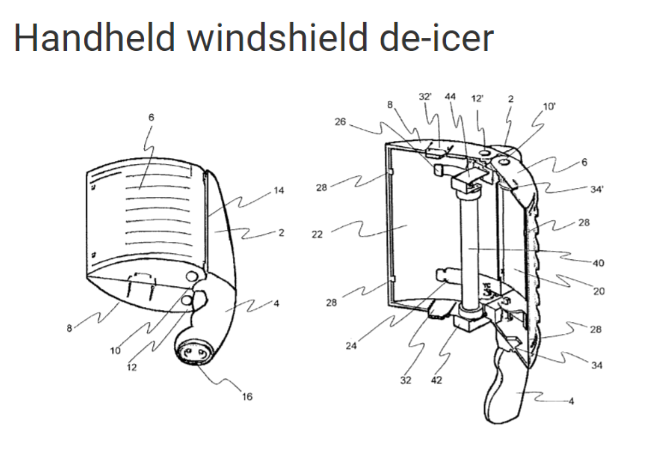 If you were an unlucky commuter during the polar vortex, this portable handheld automobile windshield deicer would have come in handy, no pun intended. This windshield deicer allows you to get out of the cold and sit inside the car as layers of ice quickly melt away before your eyes. Source: ktMINE IP Platform contains millions of patents and assignments. Polar Vortex Breaking the Bank? Every winter, an average of 250,000 homes suffer damages from frozen and burst pipes. Pipes are at risk of freezing in just 31 degrees Fahrenheit resulting in damages that can range from $2,000 to upwards of $100,000. The water pipe anti-rupture system pictured below can be used for preventing these costly household damages. Periodically spaced cross stabilizing leg members are disposed in a plane perpendicular to the connecting rod for frictionally engaging the inside of a water pipe to hold the cups in place substantially in the center and along a length of water pipe with hollows down so that they can entrap air. Day after day as the Midwest continues to experiences temperatures well below zero, having a solution to melt ice and snow is something that we take for granted. This particular patent was granted to specifically help keep traffic areas free of potentially dangerous ice and snow. This deicing composition that is applied to sidewalks and roadways is made up of alkali metal carboxylate, a surfactant, a defoamer, and a corrosion inhibitor. Having a solution like this is the reason why we can safely commute to and from work on these below freezing days. So, the next time you get in your car this winter and turn on your seat warmers or are outside plowing your driveway, remember to be thankful for the IP technology behind those items and many more that help to make the long winter months a little more bearable.